Rose Hill High School, “Rosarum Collis - Rose Hill High School 1916 - part 2,” Digital Rose Hill, accessed April 19, 2019, https://rosehill.digitalsckls.info/item/38. War:	One of the greatest means of devouring the creations of God. Men, women, children and dumb beasts perish alike. Shall strife continue until all our unrequited toil has been sunk; until the last drop of blood has been drawn and a millstone placed about the neck of generations to come? Even now can be heard the cries of agony, the endless groan and the tumult of each sacked and burning village. Then is it not time that men should be enlightened on a subject of such infinite importance to the happiness of the human race? War should be excluded from the world as laudably as those encourage who have for their purpose such malignant and desolating custom. We regard with horror the custom of ancient Heathen; in prostrating themselves before the car of an Idol to be crushed to death, in burning women alive on funeral piles of their husbands and casting children a monthly sacrifice, into the Ganges to be drowned. But that which is fashionable and popular in any country, is deemed right and honorable whatever may be its nature in the views of men better informed. But while we look back with a mixture of wonder, indignation and pity, on many customs of the former ages, are we careful to inquire whether some of the customs that we deem honorable, are not the effects of delusion? Is it not a fact that one of the most horrid customs of savage men is now popular in every nation of Christendom? What custom of the most barbarous nations is more repugnant to the feelings, piety, humanity and justice, than settling disputes by the hostility of force? When we consider how great a part of mankind have perished by the hands of one another and how large a portion of human calamity has resulted from war, surely we cannot doubt whether war is or is not the effects of delusion. War has so long been fashionable and popular that its enormity is little regarded. Yet from no other custom has more slaughter and misery occurred. But cannot the state of society and views of civilized men. be so changed as to render so barbarous a custom unnecessary and avoidable? If war were an immunity little would it exist. But since it spreads as a contagion, it has infested the universe. At the close of the eighteenth century was the American revolution, then the French revolution and then the conquest of Napoleon which instrument stirred the dust of European kingdoms into molten chaos. And today is raging, that thing for which nations have drilled without materializing, that thing of hazard and of horror has come. We find the beloved youth lying under the stars, dirty, sweaty and blood-stained, struggling for life, men in masses of millions being hurled at one another in such numerous hosts, that men never seemed so cheap. Yet never were men so dear. fittest is the only law of life, and is armed to take property of their unarmed neighbor, we call the individual a criminal or the body of men a mob and use whatever police or military force is necessary to protect society from their violence. But whenever a nation perverted from its more noble and industrial ideals, devotes its extraordinary equipment to the demonstration that might makes right, there remains no alternative for the opposing belief, than defense by force of arms, civilization, from the assaults of armed troops to enforce the law of the jungle. That is, struggle for existence and survival of the fittest. Also let us consider, if you please, the class of men chosen for a well equipped army. Are they not the choicest fruit of the nation and giants of the land? Then with the pride of the human race rushed to the battle-front leaving behind only the weak and disabled from which a new generation must spring, would it seem that war was a survival of the fittest. Besides it is an awful feature in the character of war and a strong reason why it should not be countenanced, that it involves the innocent with the guilty, in the calamities it inflicts and often falls with the greatest vengeance on those who have had no concern in national affairs. Such mode of revenge should be discountenanced by every friend to justice and humanity. Since the rulers of a nation are as liable as other people to be governed by passion and prejudice, there is as little prospect of justice in permitting war to settle national disputes as there would be in an incensed individual to be complainant, witness, judge, jury, and executioner. From what point of view, then, is war not to be regarded with horror? We have heard the words that war gives opportunity for the display of extraordinary talents of daring enterprise and intrepidity. Then with these words ringing in our ears, let robbery and piracy become as popular as war has been and will not these customs give display to the same talents and qualities of mind? For what is modern warfare but a popular, refined and legalized mode of robbery, piracy and murder preceded by a proclamation giving notice of the purpose of the war maker? For the answer, let us look to that of a pirate to Alexander the Great. “By what right,” said the king, “do you infest the seas?” The pirate replied, “By the same right that you infest the universe, but because I do it with a small ship I am called a robber, and because you do the same acts with a great fleet, you are called a conqueror.” Then shall the Christian world remain silent to the enormity of this custom, and even applaud men who are a curse to the age in which they live? On the same principle we might applaud the chief of a band of robbers and pirates. If we attach glory to such exploits, do we not encourage others to adopt the same road to fame? Would not such applause betray the most depraved taste; a taste that makes no proper distinction between virtue and vice or doing good or doing mischief; a taste to be captivated by the glare of bold and daring exploits, regardless of their end or means by which they were accomplished. men. Each corpse on the battle-field cost England alone, fifty pounds sterling. On the other hand in those years of glory with the seventeen million of slaughtered men, Australia might have been peopled; and with the eight hundred million sterling pounds of silver shot from the cannon's mouth by England, the face of the earth might have been changed, civilization planted everywhere and ignorance and poverty suppressed throughout the world. If we are near the dawn of a new era let us rejoice that the age has passed, in which men wade through slaughter to a throne and shut the gates of mercy on mankind. That men no longer consent to be used as food for powder. War is no longer our system of intermingling, nor has it given birth to a twentieth centure renaissance. And if the golden age of Athens were a product of their successful resistance to Persia, why was there no golden age in Macedon also, after Alexander’s conquest? Again if the genius of Shakespeare had its birth in national feats of arms, why was such genius shown sooner? In the thirteenth, fourteenth and fifteenth centuries there was surely enough fighting both at home and abroad, to give the inspiration required for great works of literature. In America the efflorence that should have sprung from the soil of the civil war, is by this time long since over-due. And the wars of recent times, the most horrid, terrific and bloddy massacres in history, certainly give this militarist theory no countenance. For what sustainance can a ruined and desolated country offer to its best brains and strongest hands. Even in the lands that have been exempt from invasion, the commercial and industrial dislocation will take years to adjust itself. And the mutual bitterness left behind between nation and nation, will be a further handicap to all kinds of intellectual progress. Since the world is not divided up into competitive and mutually exclusive territories, they have received a blow from which it will take years to recover. Then all our learning, art, literature, science, commerce, civilization and humanity, count as nothing if they conflict with military necessities. But when peace returns, we shall see what war is with all the power of civilization given over to its havoc; we shall see the courage of peoples lifted above the fear of death and the strain of hardships, such sacrifices as only war can produce. But the end—it must come when this vast soldiery, worn and spent, think over their experience. They cannot be the same. Europe cannot be the same Europe, but wasted and devastated. Civilization cannot be the same but set back a hundred years. The Butler County League took on debate this year as a new feature in contest. There are nine Barnes High Schools in this League, and they were divided into three triangles, the winner of each triangle to form a third triangle for the finals. Rose Hill began to work for a team early in December and by the last of the month six men were chosen which were to compose the two teams. Millard Hall, Harold Higgins and Roe McCullough the negative team. James Hartenbower, Harvey Hartenbower and Elbert Hensley the affirmative team. Should be Abandoned.” The negative team won against Eldorado. The affirmative lost to Augusta. Although the Domestic Science course has been established only this year, it has already proved itself to be one of the most popular of those offered in the High School. Perhaps a great many of the girls are planning for the future and consider Domestic Science a stepping stone toward actual problems which later they will be required to face. Twenty girls enrolled for the course this year. This number necessitated two divisions doing the same work. A room in the basement has been fitted up for the cooking classes. It looks very fresh and neat with blue tinted walls and white woodwork. Domestic Science tables, stoves and individual equipment have been furnished, not sufficient for the enrollment it is true, but we trust more can be added another year. The girls have given exhibition of their practical training in several ways. At Christmas time the patrons of the school were invited to a sewing exhibit, at which the girls served tea. On March 4 they gave a New England supper, selling tickets at 25 cents each. A nice sum was realized which is to be used in purchasing some dining-room equipment. April 6, the Board of Education and Faculty were entertained at a formal luncheon. The girls are to be congratulated on the success of the first year’s work and we believe the course will continue to be one of the most interesting, practical and popular ones in the school. Sept. 6—School begins. Students hunting for snap courses. Sept. 10—Juniors and Seniors have a reception fo.r the Sophomores, Freshmerr, and Faculty at the High School Auditorium. The chief feature of the evening was a barter social. 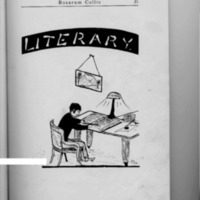 Sept. 17—Girls’ and Boys’ Literary Societies organized. Sept. 21—The girls organized a Glee Club, to meet on Tuesdays and Thursdays at 12:30. If absent without good excuse, fine five cents. Sept. 24—Box supper for benefit of Athletic Association. A success and enjoyed by every one except Mr. Walling wTho lost considerable sleep from the occasion. Sept. 24—The intermediate and primary teachers’ hearts stolen. Oct. 13—Ball game at Douglass. Mr. Rayburn wishes he had a girl to take to the game. Oct. 26—Wienie roast by baseball team and their friends (ladies). Time was spent by roasting w’ienies, toasting marshmallows and baking apples until the moon came up. Games were then played. Chaperones, Mr. Rayburn and Miss Stewart. Nov. 5—First literary program given by the girls and boys this year. Nov. 9—Farmers’ Institute at High School Auditorium, all pupils required to attend. No one present but the students. Nov. 17—Senior flag raised over the school house. Nov. 18—Seniors get a lecture. Dec. 1—Cecil McCollough leaves the Manual Training room by invitation. Dec. 2—Roscoe went to sleep in Botany. Dec. 4—Martin Wick came to school without candy. DEC. 7. Dec. 7—Wilson stops school suddenly after a bout in Manual Training. Dec. 15—Walling lectures the Freshmen. Jan. 3—Address by Loyd Ferguson. Jan. 5—Methods class forgets how to study. ’ fill . Jan. 6— Mr. Walling takes charge of methods class. War was discussion. Jan. 6—Basket ball game between Juniors and Seniors; score 70 to 25 in favor of the Seniors. Rose Hill; score 114 to 19 in favor of Rose Hill. Jan.	7—Methods class learns how to study. Jan. 7—Business Manager starts getting subscriptions fo.r the Annual. men and Sophomores. Sophomores won. Jan. 10—Reeder strikes finger in Manual Training and faints. Jan. 15—Basket ball, Andover vs. Rose Hill; 56 to 41 in favor of Rose Hill. Jan. 19—Basket ball game between Sophomores and Seniors; score 27 to 17 in favor of the Sophomores. Sophomores champions of the school. Jan. 28—Debate, Rose Hill vs. Augusta, decision in favor of Augusta,. Reception given for debators. Jan. 28—Debate, Rose Hill vs. Eldorado. Decision in favor of Rose Hill. Debators played “leap-frog” on way to Eldorado. Jan. 29—Debate team have pictures taken in Wichita to celebrate their victory over Eldorado. Feb. 2—Basket ball game with Douglass town team. Rose Hill lost. fered in Manual Training. Few have enlisted. Feb. 8—Tryout for baseball. Too co.ld; some one gets hurt. Feb. 10—Debate in Modern History class. Feb. 11—Juniors have a leap-year party. Mar. 1—Athletic Association gives a play. Mar. 4—Domestic Science class gives a New England supper. Mar. 15—Smith’s short pomp a topic for history. Mar. 17—Boys’ Literary Society gives an open program. Mar. 20—Rosco.e and Roe pile up on the floor. Mar. 23—Rayburn gives a private lesson in elocution. Mar. 24—Tryout in reading and oratory. Iva and Elbert won. April 4—Baseball game, Rose Hill vs. Valley Center; score 4 to 3 in favor of Rose Hill. April 6—Domestic Science class gives luncheon to School Board and Faculty. April 8—Botany class takes a Hike. Harold McCune falls in a peat bog. April 13—Girls’ Literary Society gives open program. April 15—Higgins goes to Wichita to interview the printer. April 16—Higgins supposed to come back. April 21—Butler County track meet. April 29—Track team goes to Clearwater. May 5—Track team goes to Winfield. May 12—Artist ought to be hanged. Oh come and be my friend and teach me of thy life. And it took at least five minutes to explain. The CORNER DRUG STORE at Douglass is the place to meet your friends. Cool off at THE CORNER DRUG STORE fountain at Douglass. Use our Phone. THE CORNER DRUG STORE, Douglass, Kansas. New and nifty drinks at THE CORNER DRUG STORE, DOUGLASS, KANSAS. It is said that most people like for the lights to go out. But it is not so with Russell. On account of the lights not working well at the basket ball court one night he lost a Ferguson and a little Moore. “Her little lamb,” replied Smith triumphantly. Oak Fleming—Much in love with himself and that without a rival. Gift Books and Novels at THE CORNER DRUG STORE, Douglass. We are always glod to see you. THE CORNER DRUG STORE, Douglass. Come in and rest. THE CORNER DRUG STORE, Douglass. Quality always. THE CORNER DRUG STORE, Douglass. Prescriptions accurately filled. THE CORNER DRUG STORE, Douglass. Unexcelled Fountain Service.—THE CORNER DRUG STORE, Douglass. Lowney’s Chocolates, box and bulk.—THE CORNER DRUG STORE, Douglass. Wanted:	A pair of stilts.—Maxine. Wanted:	A tabourette and 65 cents.—Wilson. Wanted:	A pair of cross-eyed spectacles.—Walling. Lost:	Four volumes of Pan-Germanism.—Reyer. Lost, Strayed or Stolen:	A car. Finder will be rewarded.—Lee Dennett. Wanted:	An accomplished reader (Reeder).—Bernice. New and Up-to-Date Wall Paper. THE CORNER DRUG STORE, Douglass. Phone your drug wants to THE CORNER DRUG STORE, Douglass. Our Phone is No. 24. THE CORNER DRUG STORE, Douglass. Postage paid on $1.00 orders. THE CORNER DRUG STORE, Douglass. Nyal’s Face Cream for faces. THE CORNER DRUG STORE, Douglass. There must be much in Smith’s head, so little comes out. Quality Stationery at THE CORNER DRUG STORE, Douglass. If their hopes and good intentions Were all pictured in our view. Would we judge each other harshly As we now so often do ? Would we judge all human action As the world is wont to do ? Would not many faults and defects Rest in keeping with the true? They who fail to see the fact That the motive of the action May be purer than the act. He would make them softer pointed If he saw the inward real. We are what time has made us. We may gaze on dauntless ages And our lives seem but a dream. To be reached with chime. That destiny bids us climb. And be conquerors of task and time. That we may survive the tempest And be conquerors till the last. As we totter down life’s pathway To cast our seeds across the fields. May we smile back over ages When our endless path is won. Use Nyal's Corn Remover. THE CORNER DRUG STORE, Douglass. Invites serious consideration from the young, people, as well as the older ones. Nothing, establishes a credit at a g,ood bank better than a bank account. No matter how small your business, deposit your funds and pay all accounts by check, thereby, making, a record of each transaction. A cancelled check is the best possible receipt. Get the Saving, habit and deposit your savings with us. In addition to our larg,e surplus fund and the g,reat financial responsibility of our stock holders our deposits are guaranteed by the Depositors Guaranty Fund of the State of Kansas. that comes to the graduate is selecting, the proper clothes to wear. With Spring, here, what could be a happier solution than a neat, well fitted suit, just full of Spring’s latest style? In buying, we selected just such suits as the graduate should wear and another thing,—Holmes clothes will stand the hard wear that most fellows demand. Wear one at graduation, you will be happy all through the summer for you will have a satisfactory suit! Hats, ties, shirts, socks—everything, for a man but shoes. Our splendid service at your command anytime while visiting, the city. Phone Market 5099	156 North Emporia Ave.
Low Rent—No Charge Accounts— No Collectors—Going into Market and Buying, Big Purchases for Spot Cash. C. A. 0&&, D. D. S.
There’s g,oing, to he a lot of dressy, young, chaps wearing, our clothes this spring,. If you expect to keep the pace with them you’d Letter he coming in soon. Everything, ready here for you from Hats to Socks. Departments of Manual Training, and Domestic Science have been added and are well equipped for efficient work. Work done here is accredited by the State Board of Education and by all the Colleg.es of the State.